GM Exec Hints at Possible New El Camino? Although the rumors have flared up again, the likelihood of the Holden Commodore Ute coming to the US still isn't good. Don’t get too excited by the title here, as the likelihood of the pickup coming to the US as the Chevy El Camino aren't good. However, internet rumors have been flying over the past few days because of a photo released by GM showing its North American President, Mark Reuss, behind the wheel of the car while lapping the Nurburgring. 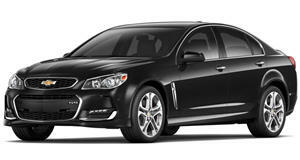 Holden also recently stated that there’ll be a big announcement about the car next month. Some people then interpreted these as a sign the Ute is coming stateside. According to several reliable sources, however, that ain’t gonna happen. For a small group of enthusiasts, having the chance to have a V8-powered semi-pickup sounds wonderful, but an even smaller percentage would actually buy one. In other words, despite the enthusiasm online, GM doesn’t believe the US market for the Ute truly exists. Along with a weak US-Australian dollar exchange rate and the notorious chicken tax, the Commodore Ute is simply too much of a niche product that even with a Chevy badge and the El Camino nameplate wouldn’t churn a profit. Business is business, after all.